uses 2 AAA batteries, works with PC and Mac. This PowerPoint presenter has a green laser pointer, a radio frequency USB receiver. Simply connect the USB receiver to the USB port of your computer and you can forward and backward the PowerPoint slides by pressing the page up and page down buttons on the laser pointer. With radio frequency technology, you don't need to point to the receiver to change slides. New receiver for Mac El Capitan: $100. 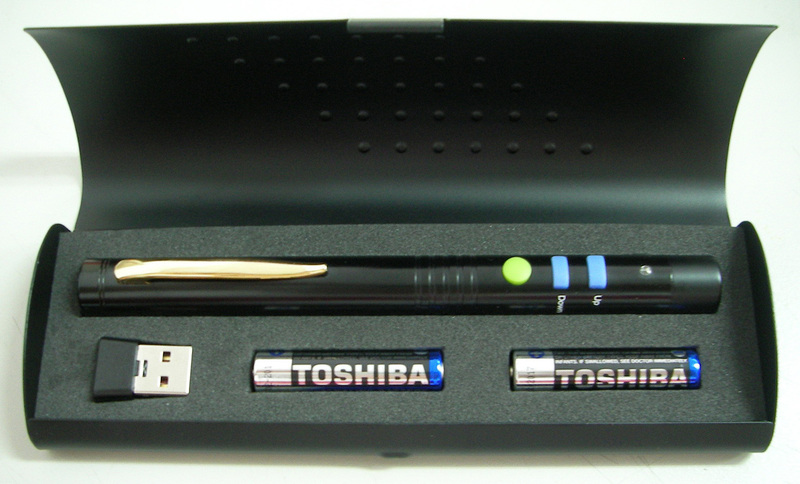 GS-8GB – New model with built-in 8GB memory in receiver and built-in rechargeable battery. 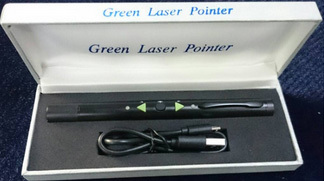 This PowerPoint presenter has a green laser pointer and a radio frequency USB receiver with built-in 8GB memory. 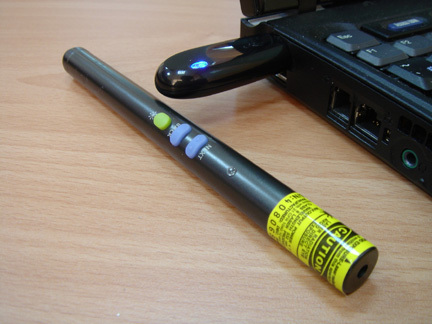 Simply connect the receiver to the USB port of your computer and you can forward and backward slides by pressing the next and back buttons on the laser pointer. You can also save and get files from the receiver with 8GB memory. It uses built-in rechargeable Lithium battery, Supports PC and Mac. Comes with USB cable and luxurious gift box. GR – Uses 2 N batteries. This PowerPoint presenter has a green laser pointer, a radio frequency USB receiver. Simply connect the USB receiver to the USB port of your computer and you can forward and backward the PowerPoint slides by pressing the page up and page down buttons on the laser pointer. With radio frequency technology, you don't need to point to the receiver to change slides. Supports PC and Mac. New receiver for new Mac: $40. Distance 10,000 ft. 10,000 ft.